Institutional Barriers to the Application of Urban Village as a Tool for Achieving Urban Sustainability in Developing Countries - the Case of Asheghabaad, Isfahan, Iran. Bahrainy, Hossein, Azizkhani, Mehdi. (1391). Institutional Barriers to the Application of Urban Village as a Tool for Achieving Urban Sustainability in Developing Countries - the Case of Asheghabaad, Isfahan, Iran.. معماری و شهرسازی آرمان شهر, 5(8), 43-58. Hossein Bahrainy; Mehdi Azizkhani. "Institutional Barriers to the Application of Urban Village as a Tool for Achieving Urban Sustainability in Developing Countries - the Case of Asheghabaad, Isfahan, Iran.". معماری و شهرسازی آرمان شهر, 5, 8, 1391, 43-58. Bahrainy, Hossein, Azizkhani, Mehdi. (1391). 'Institutional Barriers to the Application of Urban Village as a Tool for Achieving Urban Sustainability in Developing Countries - the Case of Asheghabaad, Isfahan, Iran. ', معماری و شهرسازی آرمان شهر, 5(8), pp. 43-58. Bahrainy, Hossein, Azizkhani, Mehdi. 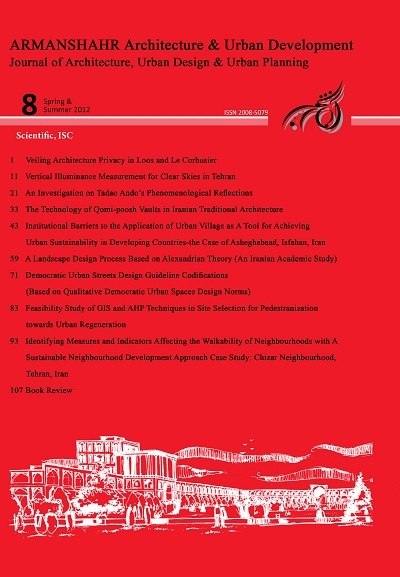 Institutional Barriers to the Application of Urban Village as a Tool for Achieving Urban Sustainability in Developing Countries - the Case of Asheghabaad, Isfahan, Iran.. معماری و شهرسازی آرمان شهر, 1391; 5(8): 43-58. 2Lecturer at Art University of Isfahan, Iran. Also, Visiting Scholar at the School of Architecture, University of Texas at Austin, USA. Aldous, T. ed. (1992). Urban Villages. Urban Villages Group. Aldous, T. ed. (1995). Economics of Urban Villages. London, Urban Villages Forum. Aldous, T. (1997). Urban Villages: A Concept for Creating Mixed-use Urban Developments on a Sustainable Scale (second edition). London, Urban Villages Forum. Audirac, I. and Shermyen, A. (1994). An evaluation of neotraditional design’s social prescription: postmodern placebo or remedy for social malaise?. Journal of Planning Education and Research, 13, 171-3. Bahrainy, H. and Aminzadeh, B. (2007). Autocratic urban design: The case of Navab Regeneration Project in central Tehran. International Planning and Development Review, 29 (2) 241-270.
creative class strategies as remedies for social problems. Australian Geographer, 37, 335-354, November. Barton, H. (ed.). (1999). Sustainable Communities: the Potential of Eco-villages. London: Earthscan. Barton, H. (2000). Do Neighbourhoods Matter? Sustainable Communities: The Potential for Eco-Neighbourhoods. London: Earthscan. Bentley, I. et al. (1985). Responsive Environments: A Guide for Planners, Designers and Developers. Luton,Local Government Management Board. Biddulph, M. (1997). Lessons from the urban design campaign. Urban Design International, 2, 199-209. Biddulph, M. (2000). Villages don’t make a city. Journal of Urban Design, 5, 65-82. Biddulph, M., Franklin, B. and Tait, M. (2002). The Urban Village: A Real or Imagined Contribution to Sustainable Development? Cardiff: City and Regional Planning, Cardiff University. Biddulph, M., Franklin, B. and Tait, M. (2003). From concept to completion: A critical analysis of the urban village. The Town Planning Review, 74, 165-193. Bourne, L. S. (1992). Self-fulfilling prophecies? Decentralization, inner city decline, and the quality of urban life. Journal of American Planning Association, 54, 454-469.
sustainable development. Journal of the American Planning Association ,62, 296–312. Calthorpe, P. (1993). The Next American Metropolis: Ecology, Community and the American Dream. Princeton:Princeton University Press. City of Isfahan (1976). The First Comprehensive Plan of Isfahan . Organic Consulting Firm, Tehran. City of Isfahan (1996). Second Comprehensive Plan of Isfahan. Naghshe Jahan Pars Consulting Firm, Tehran. City of Isfahan (2008). Revised Comprehensive Plan of Isfahan. Naghshe Jahan Pars Consulting Firm, Tehran. City of Isfahan (2010). Revitalization and Renovation Organization of the Decayed Areas of the City of Isfahan. Asheghabaad Project. City of Seattle, Planning Department (1993). Towards a Sustainable Seattle. Seattle Comprehensive Plan, (City ofSeattle: Planning Department). Cullen, G. (1961). The Concise Town-Scape. New York: Van Nostrand Reinhold. Ewing, R. (1994). Characteristics, Causes, and Effects of Sprawl: A Literature Review. Environment and Urban Issues, 21(2). Ewing, R. (1997). ‘Is Los Angeles’ sprawl desirable?. Journal of American Planning Association, 63,107-126. Frey, H. (1999). Designing the City: Towards a More Sustainable Urban Form. London, E and F N Spon. Fujii, T. and Truman A. H. (1995). The Changing Metropolitan Structure of Atlanta, Georgia: Locations of Functions and Regional Structure in Multinucleated Urban Area. Urban Geography, 16(8). Garreau, J. (1991). Edge City: Life on the New Frontier. New York, Doubleday.- GEHL, J. (1996), Life Between Buildings, Copenhagen, Arkitektens Forlag. Gordon, P. and Richardson, W. H. (1997). Are compact Cities a Desirable Planning Goal?. Journal of American Planning Association, 63, 95-106. Gratz, R. (2003). Authentic urbanism and the Jane Jacobs legacy in Urban Villages and the Making of Communities.London: Spon Press, pp. 17-23. Habibi, S. M. et al. (1992). Transformation Of Villages Near Large Cities, And Their Role In Iran’s Settlements Pattern. Case Study: Islamshahr. (InstituteOf Environmental Studies, University Of Tehran.Unpublished research report). Jacobs, J. (1961). The Death and Life of Great American Cities. Harmonds worth, Penguin. Jenks, et al., (1996). The Compact City: A Sustainable Urban Form?. London: E and F N Spon. Kats, et al., (1994). The new urbanism: toward an architecture of community. New York: McGraw-Hill. Kelbaugh, D. (1989). The Pedestrian Pocket Book: A New Suburban Design Strategy, Princeton, Princeton University Press. Kelbaugh, D. (1992). The Seattle Commons: A Case study in the Politics and Planning of an Urban Village. Policy Studies Journal, 23, December. Kelly. E. D, (1993). Managing Community Growth: Policies, Techniques and Impacts, Westport, CT, Praeger. Krier, L. (1998). Architecture: Choice or Fate, Windsor, Andreas Papadakis. Krieger, A. and Lennertz, W. (1991). Andres Duany and Elizabeth Plater-Zyberk: Towns and Town Making Principles, un published master’s thesis HarvardUniversity, M. A.
Lessinger, J. (1962). The case for Scatteration: Some Reflections on the National Capital Region Plan for the Year 2000. Journal of American Institute of Planners, 28, 159-169. Leung, H. (1995). A new kind of sprawl, Plan Canada, September, 4-5. Lynch, K. (1961). The Pattern of Metropolis in: Banerjee, T. and Southworth, M. (eds) (1991). City Sense and City Design. Writings and Projects of Kevin Lynch, Cambridge, Mass: MIT Press, pp. 47-64. Lynch, K. (1981). Theory of Good City Form. Cambridge, MA, MIT Press. Madanipour, A. (2001). How relevant is ‘planning by neighbourhoods’ today?. Town Planning Review, 72, 171-91. Mazumdar, S. (2000). Autocratic Control and Urban Design: The Case of Tehran, Iran. Journal of Urban Design, 5, 317- 338. Morrison, T. H. (2006). Pursuing rural sustainability at the regional level: Key lessons from the literature on institutions, integration and the environment. Journal of Planning Literature, 21, November. Neal, P. (ed. ), (2003). Urban Villages , and the Making of Communities. New York: Spon Press. Ostrom, E. (1990). Governing the Commons: The Evolution of Institutions for Collective Action, Cambridge.Cambridge University Press. Pivo, G. (1990). The net of mixed beads: Suburban office development in six metropolitan regions. Journal of American Planning Association, 56, 457-469. Rudlin, D. and Falk, N. (1999). Building the Twenty-first Century Home, Oxford, Butterworth Heinemann. Sennett, R. (1977). The Fall of Public Man. London, Faber and Faber. Sennett, R. (1990). The Conscience of the Eye: The design and Social Life of Cities. London: Faber and Faber. Southworth, M. and Owens, Peter M.(1993). The evolving metropolis: Studies of community, neighbourhood, and street form at the urban edge. Journal of the American Planning Association, 59, 271- 287. Southworth, M. (1997). Walkable suburbs? An evaluation of neotraditional communities at the urban edge, Journal of Urban Design, 2, 9-34.
and the implication for urban design in the American metropolis. Journal of the American Planning Association, 63, 28-44. Taylor, N. (1974). The Village in the City, London, Maurice Temple Smith. Teaford, Jon C. (1990). The Road Rough to Renaissance: Urban Revitalization in America, 1940–1985. Baltimore:Johns Hopkins University Press. Thompson-Fawcett, M. (2000). The Contribution of Urban Villages to Sustainable Development, in K.
Williams, E. Burton and M. Jenks (eds), Achieving Sustainable Urban Form, London: E and F N Soon, pp. Wagner, et al. (1995). The Seattle Commons: A Case Study in the Politics and Planning of an Urban Village. Policy Studies Journal. Weimer, D. L. (1995). Institutional Design: Overview, in Institutional Design Ed. D. L. Weimer Kluwer, Dordrecht, pp.1-16. Weitz, J. and Moore, T. (1998). Development inside Urban Growth Boundaries, Oregon’s Empirical Evidence of Contiguous Urban Form. Journal of American Planning Association, 64, 424-440. Zebardast, E. (2006). Marginalization of the urban poor and the expansion of the spontaneous settlements on the Tehran Metropolitan fringe. Cities. 3, 439-454. Zheng, S., et al. (2009). Urban villages in China: A 2008 survey of migrant. Eurasian Geography and Economics, 50, 425–446.